Killer Klowns from Outer Space is a 1988 American science fiction horror comedy movie made by The Chiodo Brothers and starring Grant Cramer and Suzanne Snyder. It is the only Chiodo Brothers' directed and written film�they have worked in many other projects in other roles, such as producing and visual effects. The filming took place in the city of Watsonville and at the Santa Cruz Beach Boardwalk. 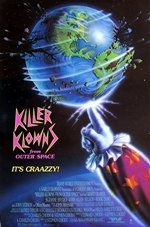 The film is about a race of aliens who resemble evil clowns that arrive on Earth to capture and harvest people to use as sustenance. Rotten Tomatoes gave it a 71% approval rating, and it has since become a cult film.